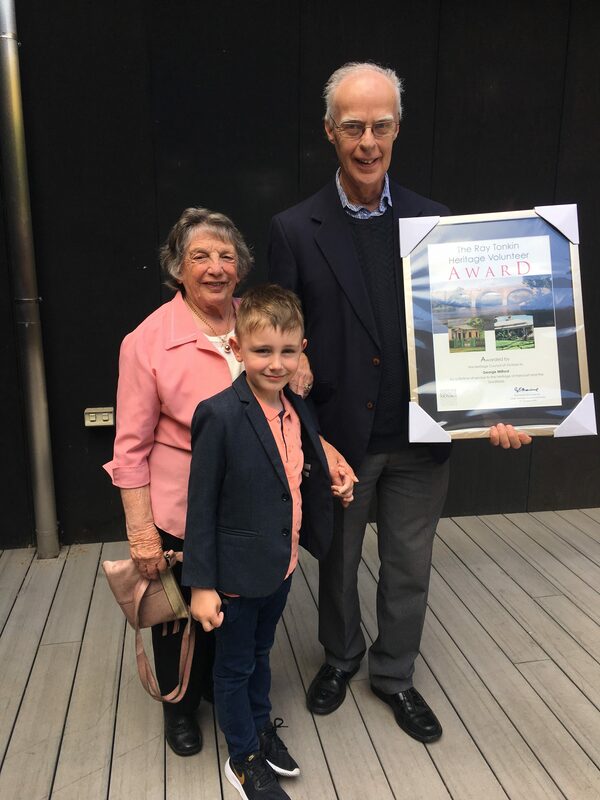 I was lucky enough to be present when George Milford, our treasurer, was presented the Ray Tonkin award for volunteer services to heritage by the Heritage Council of Victoria on Saturday 27 October. Many of you would be aware of his tireless efforts and work to protect the heritage of the goldfields region and for this award his tireless work for Buda was included. When I made a call out to previous committee members associated with George to comment on then achievement, Merlyn Prichard, past president of Buda had this to say about George “Probably his greatest contribution to my mind has been his historical talks on a range of subjects over the years which have imbued people with knowledge & enthusiasm. The talks are so well researched & delivered in a most engaging style! He has kept alive the interest in our past & encouraged all of us to value, appreciate & save what we have in our community. “As a trustee of the Castlemaine Art Gallery and Historical Museum that owns Buda, and as our treasurer, George has taken the approach the same way in all that he does, such a down to earth; or dare we say, a wonderfully old-fashioned way, with wisdom and insight that we appreciate so much. There are few men like George and he is to be valued greatly for his integrity, intellect and dry humour. We are very fortunate indeed to be able to call on his expertise. Well done Heritage Council in choosing George Milford as an award winner.